Welcome to my latest creation: JYM Supplement Science. 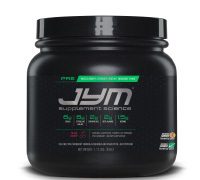 JYM combines real science with real ingredients to deliver unreal results. Pre JYM, my cutting-edge pre-workout product, is poised to revolutionize the pre-workout category. Supplement companies love to claim they’ve created a real “game-changer.” Pre JYM doesn’t play that game. It doesn’t need hype or flashy marketing. With 13 hand-picked ingredients included at full doses, Pre JYM is in a league of its own. Put simply, Pre JYM is the most effective pre-workout supplement ever developed. It’s built on solid science, years of study, and decades of professional experience. Nothing is hidden and there is no filler. Pre JYM is research made real. It’s pure pre-workout fuel. 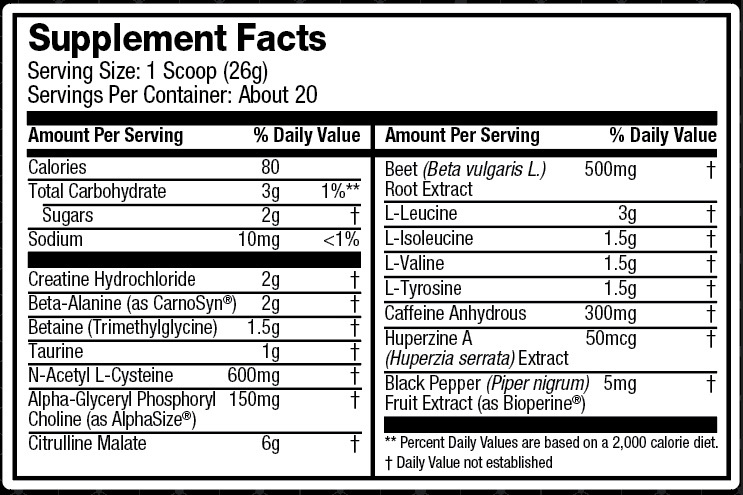 Look at the supplement facts panel on your favorite pre-workout product, and you’ll most likely see the term “proprietary blend.” Supplement companies want you to think this means they’ve created a special blend of ingredients that magically work together to deliver unique results. Because this blend is so amazing, they have to keep the doses of each ingredient secret so no other company steals the formula. The truth, however, is that propriety blends serve a different purpose. They allow supplement companies to hide how little of each ingredient they’ve actually put in a product. This results in cheap, under-dosed, ineffective supplements. Pre JYM doesn’t use proprietary blends. Take a look at its supplement facts panel, and you’ll see the actual doses of all 13 ingredients. I have nothing to hide. I’m proud of the amount of each and every ingredient I’ve included. Together, those 13 ingredients in those exact doses are the closest thing to a magical formula that you’re going to find. For the reasons detailed above, many supplement companies are moving toward transparency and axing proprietary blends. That’s a good thing. However, these companies are still guilty of grossly under-dosing ingredients. Take citrulline malate, for example. The research on this potent amino acid shows that you need six grams per dose. While most pre-workout products leave out citrulline entirely, none of them provide anywhere close to six grams. Until now. A handful of companies are as fed up as I am with proprietary blends and under-dosed formulas, but they fall short by using “abbreviated” formulas. An abbreviated formula is one that uses proper dosing of all ingredients but only includes a few ingredients. Take, for example, a pre-workout formula that includes beta-alanine, creatine, caffeine and tyrosine. There’s nothing wrong with it, but it could be a lot more effective through the addition of ingredients like citrulline malate, betaine, and BCAAs, to name just a few. Why would companies not create the most robust formula possible? Because adding more ingredients costs too much money. Pre JYM includes 13 ingredients that work in concert to prime the body for intense workouts, making it the most complete pre-workout supplement available. Many companies also try to trick buyers by calling their pre-workout product “concentrated.” A serving of one of these “concentrated” products can contain as few as three to six grams of powder. What kind of magic did they use to cram enough creatine, beta-alanine, citrulline, arginine, caffeine and other ingredients into that tiny dose? They didn’t use any magic, which is why all of those “concentrated” formulas also include proprietary blends. That’s also why the serving size of Pre JYM is more than 26 grams. It contains 13 ingredients at proper, powerful doses. I’ve been studying supplement science in the lab and gym for decades. I’ve been delivering supplement advice to millions of people in the pages of Muscle & Fitness, FLEX and Muscle & Fitness Hers, as well as my own website, JimStoppani.com, for over a decade. Most importantly, I’ve been training since I was 11 years old. Before each of my workouts, I draw on all of my experience and all of my education to concoct my own pre-workout supplement, combining ingredients from 13 different bottles and tubs. That’s why I developed Pre JYM. I wanted to give my friends, colleagues, all of you, and myself the ability to access, in one bottle, the best ingredients in the exact doses suggested to help build lean muscle, torch body fat, improve strength, and boost speed. Prepare to experience the power of real science, real ingredients, and unreal results.